Although LandOps has never been active in public land use issues, we certainly have been affected by closures such as the closure of our favorite part of Johnson Valley. The Bureau of Land Management (BLM) is in the process of conducting a court-ordered review of all motorized routes on BLM managed land in the Western Mojave. This could affect the roads that we could use on our ops. In 2006, the BLM adopted the Western Mojave Management Plan, which included designation of authorized OHV routes. Our “friends” at the Center for Biological Diversity (CBD) filed suit and in 2009 the court found that the BLM violated the National Environment Protection Act (NEPA) and the Federal Land Policy Management Act (FLMPA) because the method used to designate OHV routes was “flawed”. In 2011, the court ordered BLM to prepare a revised OHV route network. The original schedule for the OHV route network revisions called for the plan to be finalized by 2014. However the court has extended the deadline; BLM must now issue the final decision by October 2019. 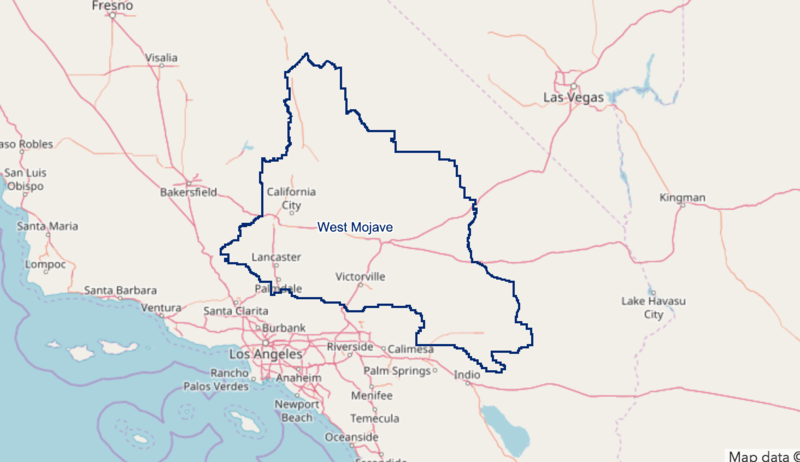 The area affected by the West Mojave Route Network Project consists of BLM managed land generally bounded by the Angeles National Forest and San Bernardino National Forest on the south, Los Angeles County and the Sierra Nevada mountain range on the west, Death Valley National Park on the north, Mojave National Preserve and Joshua Tree National Park on the east. The BLM has (as of March 16, 2018) issued a Draft Supplemental Environment Impact Statement (DSEIS) and draft transportation management plans (TMP). The public has 90 days to submit comments on the DSEIS and draft TMP. I have found that the maps in the TMP are hard to read; instead, I have found that the online, interactive map is a better way to see which trails are due to remain open or closed. By selecting alternative 1, 2, 3 or 4 you can see which trails would remain open (green) or closed (red). If you have ever run any trails in the project area, I suggest that you open up the interactive map (see post #2 above) and see if the trail is going to remain open (green) or proposed to be closed (red). For example, if you participated in the Cuddeback Dry Lake or Fremont Peak ops, open the interactive map, put a check mark in the "Layers" for alternative 1, 2, 3 or 4. Zoom into the trail(s) that you are familiar with. Whether a trail is red or green, you can click on the trail, and it will open a comment form for you to state why you want it to be open (or closed).